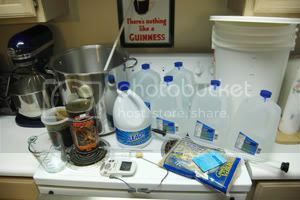 Like most beer geeks, I've always wanted to take the plunge and brew my own beer. After reading up on the process for years, my wife and I decided to pull the trigger and go for it. After re-reading the instructions for your first batch in Charlie Papazian's The Joy Complete of Homebrewing (the best book I've found on the subject), we were ready to track down the equipment and ingredients we were going to need. Luckily for us, it turns out there is a terrific brewing supply store just a few miles from our apartment. Brew It Yourself, run by Ray Philbrook, sold us just about everything we needed. Since its generally my favorite style, we decided to make a Stout. 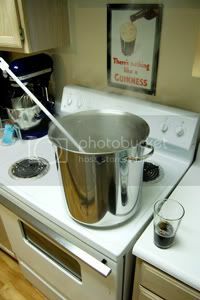 And as my father-in-law had a heart transplant Sunday, we decided to name it Young At Heart Stout. The first step is taking care of sanitation, one of the most important components of quality beer. 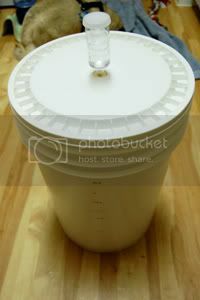 After a quick rinse in hot water, we filled the fermentation bucket with water and added 2 ounces of unscented bleach. Everything else that would come in contact with the beer: the spoon, the bubbler, the hydrometer, the sampler and even the lid of the bucket were rinsed in hot water and added to the bucket. Meanwhile, we filled the sink with hot water and added the containers of malt extract to make them easier to pour. After everything had sat for around five minutes, the kettle was put on the heat and the two room-temperature gallons of spring water were added. While the water was heating, we rinsed off the brewer's spoon for use during boiling. Once the water reached a boil, we removed the kettle from the heat and poured in the containers of malt extract and the sugar. The kettle was put back on the heat and monitored until it was once again boiling. At that point, we started a fifteen minute timer and made sure it didn't boil over, stirring occasionally. At the end of the fifteen minutes, we put the kettle in the sink and filled it with cool water from the tap. The initial temperature was around 145°F. While waiting for it to cool, we rinsed off everything else that had been sanitized and added the yeast packet to one cup of 95°F water. After around thirty minutes, and several water changes, the temperature of the mixture in the kettle had dropped to around 97°F. We poured the three gallons of chilled water into the fermentation bucket and carefully added the cooled mixture. After a quick stir, we took the temperature and, using the sampler to take a sample, took a quick gravity reading. The final temperature before initial fermentation was 66°F and the original gravity clocked in at 1.043 (adjusted for temperature). Next, we gently poured the yeast slurry into the bucket. After sealing the lid tight, we attached the bubbler (filled with water) and moved the fermenter to the hall closet. In about a week, when it's time to bottle, we're going to need to have about 55 twelve ounce bottles ready to accept the beer. A long time ago, I decided that I wanted to use New Belgium bottles, so I've been saving them off and on for a while now. I'm about twenty bottles short, so I guess I'm going to have to get drinking. It was really fun making our own beer. I can't wait to see how it turns out!! So have you tried brewing again since the Young At Heart Stout? Sounds like your first experience was a little disheartening. Stick with it though. I have a couple of words of advice for you as a fellow "New Brewer" if you would like to hear then. You can write to me at my blog Flagstaff Daily Photo http://flagstaffphoto.blogspot.com or at my email dustinjblodgett at yahoo dot com. Hope to hear from you and good luck brewing. I really enjoy your reviews and it's obvious you know a thing or 10,000 about beer. Keep up the good work.